Meet the Beatles for Real: Paul and who? 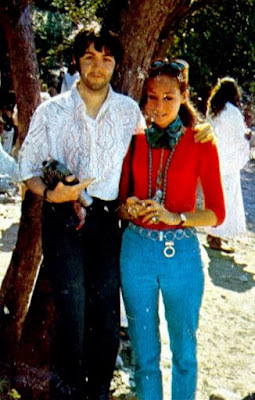 This photo is in my files along with the photos of John and the Maharshi in the helicopter. Who is this girl in this photo? Anyone have any clues? Paul wearing the shirt he wore on the All You Need Is Love live broadcast. I think he did the designs himself at home the night before the broadcast. That model/actress is Marisa Berenson in the picture. You're right, I forgot to write actress - sorry about that!